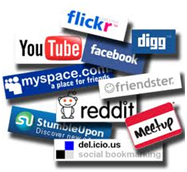 Social media as a driving force….or how do they turn B2C into C2B and perhaps into P2P ? Social media as a driving force…. or how do they turn B2C into C2B and perhaps into P2P ? The expansion of social media forces companies to consider themselves being an embedded ecosystem, which means seeing the connections between the inside and the outside of the company. They completely turn around the traditional system of education and health care services and accelerate the shift from B2C to C2B and P2P. On the top of that they also transform companies into an extended collaborating ecosystem from customer to supplier. A sort of working community. That sounds much better, doesn’t it ? Customers play more a participative role within business processes. That requires from you as a company a certain level of preparation. Social media change our attitudes and insights, they shift the power end force companies by using Review, Reputation and Ranking to act more transparent and do it with integrity . All these processes are of course not new, they got started in the late 1980s. Social media are however seen as a strong accelerator of the process. Like the Web and email they should change companies in three steps. First, the operational part. It is about short- term cost cut. The second step is an organizational part. New structures, processes, employing social media manager or chief meaning officer and chief listening officer, organization of a distributed team work through support by wiki’s; and as the third step- steering: strategy and business models are now in transition. In the near future the concept “company” will undergo a huge change; companies will become more project based ecosystems, temporarily structures. Just like films are being made, a temporary team of pro’s does the job. Neue Kombinationen (new structures) focused on flexibility instead of continuity. The transition from employer into a entrepreneur, increasing number of self-employed will be accompanying this process . The new entrepreneur has to be aware of his own capabilities, to pool, to ally and to link-who’s your pal- and be able to build giants with a particular and clearly defined goal. TMC is successful example of this process. The new company, understood as an ecosystem, will also, more than in the past, reflect ‘weconomics’ and act on a smaller geographical area: community economics, reflecting nearonomics, will be part of the business future I think. Why searching globally if your neighbours have the answer? I’m very sure that with the internet we discover our neighbours again: the sharing economy arises. We use each others cars, appartments, buy vegetables from each other gardens and a lot more. P2P! HRM 2.0 with the main focus on integrity based collaboration and payment for performance, promotion for ability is essential to make this mechanism move. What is the truth behind that ? Not collaborating costs money and is no option today. It pulls you off the transparent market created by digital media. Social media enable the customers to find each other and to influence the companies through “group purchase ” www.unitedconsumers.com or www.groupon.com are examples of such combinations: buyer’s power in action! On demand marketing as far as there still exists marketing in doing business in the digital age. Marketing basically becomes Sales, and the game is about timing and recognizing your window of opportunity. As a rule, the consumer uses prior to a big purchase to gain some information on the Internet. Who is not seen there is off! A nice recent example is www.99vrienden.nl. What I most like about this example is that I predicted the transition “from line flight to charter” already in 2001, but I was surely not the only one. If you are able to see the flight as a temporarily community, puzzle pieces fall into their place. If you see it once you will see it everywhere. It’s likely to last shorter than 50 years ago, but still at least 10 years or longer before the business is about to realize the change. See it as a sort of lesson. And how long do you think it’s going to take before it is really in the genes of the companies? Probably much longer. Today’s matchmaking is possible not only through LinkedIn but also on www.noppes.nl or the Estonia’s Bank of Happiness : you are fixing my garden, I am doing your income tax return. Barter is reborn! Co-creation, like during the development of Fiat 500 is another example. Fiat and BMW involved their consumers into design co-creation processes , of course not limitlessly, but it contributes sufficiently to a certain form of mass customization, which didn’t fit within the scientific management models. Dutch examples: developments of a new taste of Lay chips and Pickwick tea. The same trend can be seen at Dell or Customize your shirt. Crowdsourcing and open innovation are in the air. Banking , insurance businesses and crowdfunding are actually also a part of this process. Here some Dutch crowdfunding examples. Through www.voordekunst.nl the artist can collect today the money needed. The moneyskype is coming: P2P banking. If you have money surplus and I, let’s assume, some shortage, there are some eBay-like business opportunities for us available. www.smava.de and http://uk.zopa.com/ZopaWeb/ are just few examples of P2P social banking with customer self-service. What consequences does it imply for an participative bank? To arrange the security and some sort eBay-like trust system implementation. But as I have mentioned before, the incubation time for the ideas of this format takes at least 10 years. The core message is that the consumer is on the move. The movements don’t come from inside- out but are like two ways- traffic- outside-in and inside- out: thus a dialog. But as a company you may need a certain preparation. This collaboration form can only succeed if you as a company have the ability and courage to release where possible the control. Exactly the opposite from what we got used to and what we have learned at school. Organize the communicational excellence. Listen to Ken Robinson. Do you recognize engagement as a main topic? The company, no matter how big and complicated it might be, should be experienced by its customer as a small sized enterprise, where everybody knows everybody. Sweep the complexity aside. The Enterprise, Health, Higher professional Education should be organized in the way , enabling them to see Human beings and recognize their needs. The myth of the acting management is becoming step by step the creating reality of the empowered customers and courageous entrepreneurs. « Was ist Reichtum ?